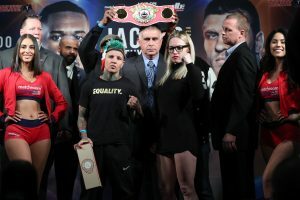 Professional boxers Heather Hardy and Shelly Vincent are no strangers to throwing punches in the ring, but just days ahead of their long-awaited rematch at Madison Square Garden, the outspoken fighters announced they would put down their gloves to unite with the U.S. Center for SafeSport and share the importance of athlete well-being through abuse-prevention in sport. Hardy and Vincent will box on Oct. 27 at the Hulu Theater at Madison Square Garden in New York. The fight will be telecast by HBO. It’s the second women’s boxing fight of more than 1,100 matches aired in the network’s history.